Completed in 2010, the Khan Shatyr is a huge, 150m tall tent-like structure made out of ethylene tetrafluoroethylene cushions, located at the end of the Nurzhol boulevard. Inside the Khan Shatyr there is a huge shopping mall with shops selling western branded goods and a food court. Near the Khan Shatyr lies the Astana Opera ()State Theatre of Opera and Ballet) which was completed in 2013 and has the shape of a Greek temple. 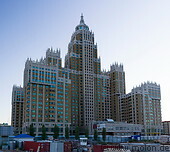 The Kazmunaygas headquarters are another emblematic building with an arch like structure.